rates in the first 6 months. increase their conversion rate and phone calls. Ryan Montgomery, Attorney at Law: Protecting the Rights of the Injured When they Can’t Protect Themselves. representing those who have been injured and can’t protect themselves. Their lawyers bring a variety of skills to the table as lawyers, mediators and workers’ compensation specialists. The cases Ryan Montgomery was looking to win. 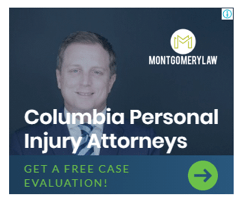 When Ryan Montgomery came to Cardinal, the law firm had just expanded into Columbia, SC. A new website needed to be developed. A marketing plan needed to be put in place that would help drive customers to their law offices, effectively growing their business. How Cardinal attacked the problem. Knowing the verdict Ryan Montgomery was after, we rose to the challenge and started by designing a new website for the company, making it easier to use and more informative. Next, came the challenge of getting people to see the site. 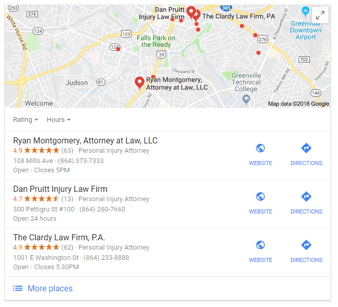 Employing our knowledge of Google keywords and SEO, we moved the law firm up multiple pages in Google search results, making it the top result of the first page in both the local map pack results and search listings. We created premium content with keywords in mind. Putting their advertising dollars to the best use, Cardinal reorganized and optimized their PPC campaigns first, improving the efficiency of Ryan Montgomery’s advertising campaigns. Crunching the hard numbers proved the case that what Cardinal had done worked. Within the first six months, Ryan Montgomery saw a 62.79 percent increase in organic conversion rates. Going beyond just the organic conversion rates, they saw an increase of 73.33 percent in organic website conversions in actual phone calls made and forms filled. Because keeping viewers at your site is critical to business, the drop in bounce rate to just 5 percent is noteworthy. On the paid side, their advertising money came in with the verdict they desired. There was a 117.29 percent increase in phone calls and form fills. Just opening a new office in Columbia, SC, meant a need to find new clients. They saw an increase in their conversions in phone calls made and forms filled out by 134.48 percent there. 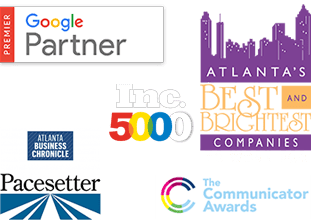 Greenville, SC, where their original office is located, saw an increase of 142.85 percent in conversion rates to actual phone calls and forms filled out, and their overall search campaign conversion rate grew by over 16 percent. The gavel dropped with the verdict Ryan Montgomery was seeking to get.